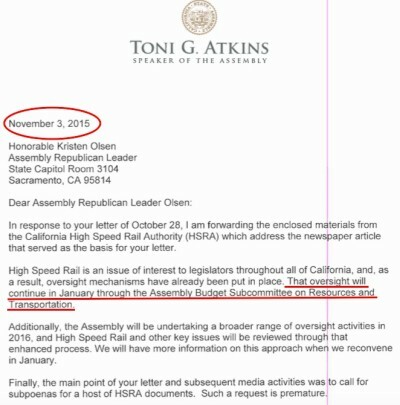 We are commenting on your November 3, 2015 letter to Assembly Minority Leader Kristen Olsen about California High-Speed Rail oversight. Your letter claims that legislative oversight of the Authority planned for 2016 will be sufficient, and it rejects a request for the legislature to issue a subpoena to the Authority. Your response, along with a law enacted in June to reduce legislative oversight, seems to indicate that the legislative branch is essentially in cahoots with the administration of Governor Brown in limiting public scrutiny of this troubled mega-project. By declining legislative oversight of the California High-Speed Rail Authority, you are evading an uncomfortable political reality and depending on the courts to reveal the truth about the status of this project. Our extensive interaction during the past five years with the California High-Speed Rail Authority has revealed the agency’s culture. It works to conceal documents that contradict its public statements, its business plans, and other reports provided to the legislature. It’s understandable why the California High-Speed Rail Authority avoids accountability. It cannot possibly comply with Proposition 1A. We urge you to reverse your position and take extraordinary means to obtain internal documents and public testimony from officials of the California High-Speed Rail Authority. Citizens for California High Speed Rail Accountability (CCHSRA) was formed in 2011 by farmers, small business owners, and other residents of Kings County and rural Fresno County. 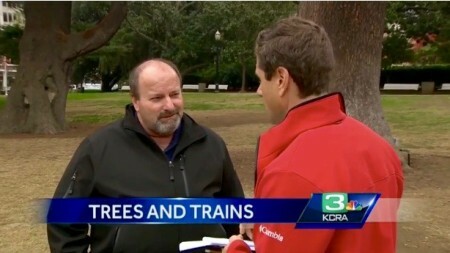 It was a response to the lack of public accountability we observed firsthand from the California High-Speed Rail Authority as they planned the rail alignment through our rural agricultural communities. Our introduction to the Authority gave us a foreshadowing of their typical conduct, which continues today. Representatives of the Authority began trespassing on our properties without notice or permission of the owners. Initially bewildered, we soon discovered these outsiders were assessing our land in preparation for the Authority to take it, either through unfairly low financial offers or through eminent domain. Meanwhile, the Authority established a rail alignment that literally put the track through the front door and out the back door of the only livestock rendering facility south of Fresno. It was stunning. A conspiracy theorist would conclude that the path was deliberately chosen to undermine the region’s dairy industry and make an ideological statement of some sort. We perceived the disdain of agency officials for the agricultural life and rural traditions of our community. You may not be aware that most of the 1300 parcel owners now targeted by the California High-Speed Rail Authority are resisting the government appropriation of our land. Every month, the State Public Works Board takes action to obtain that land. After we became a visible critic of the agency’s conduct, the California High-Speed Rail Authority held some local community meetings devoid of substance in our region. To add to our frustration, someone arranged these meetings to be flooded with union construction workers from outside the area. The Authority briefly opened an office in Hanford (the county seat of Kings County) for community outreach and then shut it down without public notice, perhaps calculating it could better handle the rural communities by crushing us with political power. For almost five years, our members have met weekly for status updates at the Kings County Farm Bureau office, attended almost every monthly meeting of the Authority board, and studied the legislative-mandated reports and public relations material available to the public. We identified numerous inconsistencies and questionable claims from the Authority to the Kings County Board of Supervisors, the California legislature, and the public. 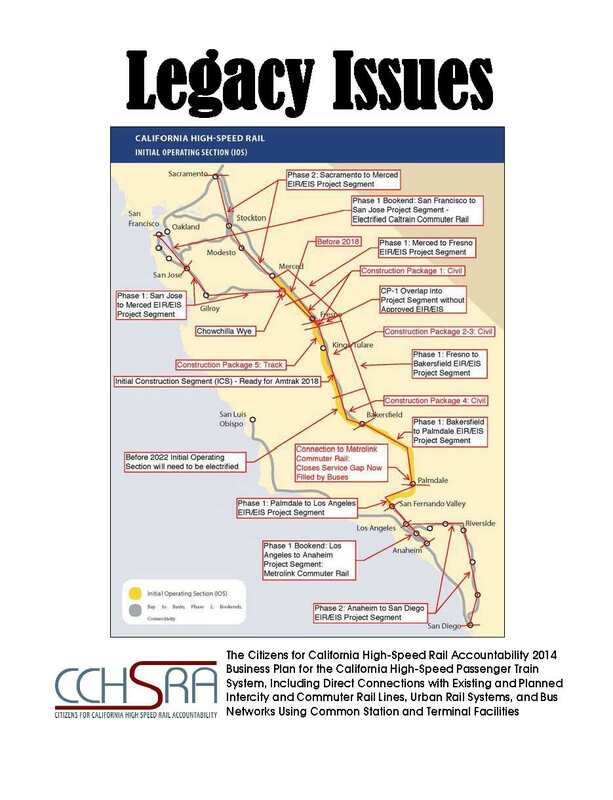 The 2014 Final Business Plan for California High-Speed Rail fails to fulfill statutory requirements and presents a false picture of the program. It’s already woefully out of date. We hired some lawyers and policy consultants to perform detailed analysis of the performance of the California High-Speed Rail Authority, particularly in relationship to the mandates in Proposition 1A and in state laws implemented in conjunction with Proposition 1A. They confirmed our impression that public accountability is sorely lacking for the California High-Speed Rail Authority. Some of the most devastating information obtained by Citizens for California High Speed Rail Accountability is only publicly available because of public records requests and off-the-cuff remarks made at board meetings. The discovery of unreleased internal Authority documents by the Los Angeles Times reporter isn’t surprising to us. We surmise that your official perspective about the California High-Speed Rail Authority comes primarily from its representatives through communications such as an October 30, 2015 letter to you from the chairperson and the CEO of the California High-Speed Rail Authority. This letter rests on outdated Authority claims such as the June 2013 announcement of bid results for Construction Package 1 (civil engineering work from Madera to Fresno). Original bidding guidelines for Construction Package 1 emphasized the importance of experience with high-speed rail construction. During the bidding process, the Chairman and the CEO of the Authority – without any public vetting nor board action – changed the bidding rules. In the end, the contract was awarded to Tutor Perini/Zachry/Parsons, a Joint Venture, which had the least amount of experience with high-speed rail construction. You may not be aware that the California High-Speed Rail Authority has not even advertised a request for bidder qualifications yet for laying track for what is currently the Initial Construction Section (Madera to Shafter). That would be Construction Package 5. Actual earthwork has recently begun for Construction Package 1, a bid has been awarded for Construction Package 2-3, and bidders have been prequalified for Construction Package 4. Realize that all of this work is merely civil engineering – no track, no electrification, no heavy maintenance facility, no stations – from Madera to Shafter. And Merced and Bakersfield are not incorporated into this work. As far as electrification work for the genuine high-speed rail capability that voters expected when they voted for Proposition 1A in November 2008, it looks like they will need to settle for eventual electrification of the “bookend” track that the Authority will share with Caltrain commuter service (San Francisco to San Jose). The electrified Initial Operating Segment from Madera or Merced to somewhere in Los Angeles County is essentially a bunch of options drawn on paper. Behind the Authority’s public relations campaign (funded by a $500,000 item in the fiscal year 2015-16 state budget), the specifics of the project’s outlook are grim. Perhaps the most egregious act to suppress accountability for the California High-Speed Rail Authority occurred this past summer. Language was inserted into a budget trailer bill (Assembly Bill 95) eliminating the requirement for the Authority to produce and submit some progress reports and reducing the frequency for the Authority to produce and submit other progress reports. Echoing these comments, you claim in your November 3, 2015 letter that “oversight mechanisms have already been put in place.” Actually, oversight mechanisms are being removed, and you apparently condoned it as Assembly Speaker and voted for it. We never expected the executive branch to acknowledge the California High-Speed Rail Authority’s lack of public accountability, but we expected the legislative branch to insist on it. Instead, it will be the judicial branch that fulfills its role to serve the people. In less than six months, the California legislative leadership, the California High-Speed Rail Authority, and Governor Brown will be exposed for concealing the reality of this project. We expect a Sacramento County Superior Court judge will confirm the Authority’s lack of accountability and failure to comply with Proposition 1A through a decision in Tos v. California High-Speed Rail Authority. Oral arguments are scheduled for February 11, 2016. You still have time to respond to Assemblywoman Olsen’s request and avoid tainting the legislature in the California High-Speed Rail scandal. We urge you to issue a subpoena to the California High-Speed Rail Authority immediately and end its continual deception of the People of California. Leadership of Citizens for California High-Speed Rail Accountability (CCHSRA) asserts that the clear, unequivocal positions of several candidates against the current California High-Speed Rail plan were an asset in motivating San Joaquin Valley voters to go to the polls on Election Day. Oliveira cites the strong election performance of Congressman David Valadao, Congressman Jeff Denham, State Senator Andy Vidak, and the unexpected preliminary lead of 736 votes of Johnny Tacherra (challenger to Congressman Jim Costa). All of these candidates spoke openly to a broad spectrum of local residents about the drawbacks and challenges of water, agriculture, and high-speed rail. 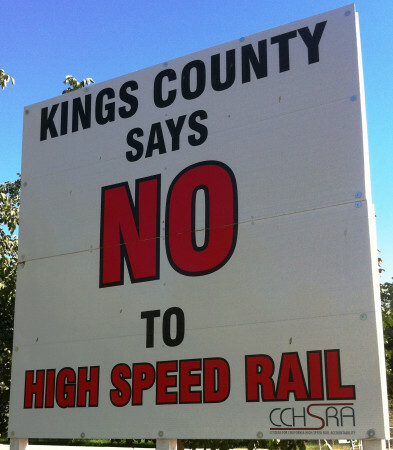 Citizens for California High Speed Rail Accountability (CCHSRA) is a nonprofit, nonpartisan advocacy group based in Kings County. Members include residents of the City of Hanford and surrounding rural areas, along with other Californians affected by the high-speed rail. 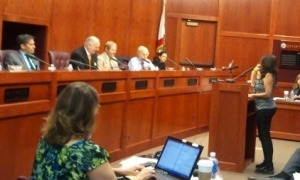 The group has been in the forefront since June 2011 of attempting to get the California High-Speed Rail Authority (CHSRA) and its board to be in full compliance with Proposition 1A, which the state’s voters passed in November 2008.